The sturdy-gear maker is moving to a larger space in Gorham. GORHAM — Maine wallet and outdoor gear company Flowfold is expanding to a new manufacturing space as the business grows in the U.S. and overseas. The company’s new space, in a Gorham business park, is more than twice the size of the current Scarborough headquarters. But that doesn’t mean it is huge – just 3,000 square feet of production and office in a shared building. “We don’t need that much space,” co-founder Devin McNeill said during a tour of the new location Friday. Even the modest space will allow the company to spread out, McNeill said. It will be able to do 80 percent of its manufacturing in-house, instead of with contract labor, and have more efficient inventory storage and shipping. The company is investing almost $90,000 in new sewing machines and an automated fabric-cutting table for its growing line of products. 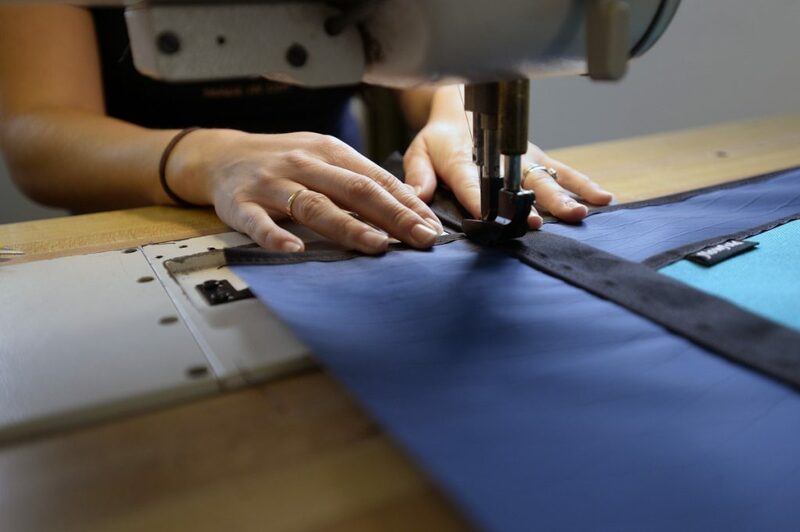 Eight years ago, Flowfold starting making wallets with repurposed sail fabric, but now sells U.S.-made backpacks, tote bags, dog collars and leashes, T-shirts and hats. This year, it launched a partnership with L.L. Bean to test and make certain gear. Clothing retailer Urban Outfitters recently started carrying some Flowfold products and it plans to launch a customization service so customers can mix and match their own colors and styles. McNeill hopes to hire four new employees with the new space, bringing the company to 12. The company’s growth was highlighted by Linda McMahon, administrator of the U.S. Small Business Administration and former professional wrestling executive, in a visit to the company Friday. McMahon promoted President Trump’s economic policies, including deregulation, business tax cuts and trade, particularly the United States-Mexico-Canada Agreement, a recently renegotiated version of the North American Free Trade Agreement. The USMCA still needs congressional approval. “What makes this president so unique is that he truly does understand small business,” McMahon said. While a new free trade agreement with Mexico and Canada is helpful, Flowfold has focused its growing export segment on Asia, said COO James Morin. The company has been especially successful in Japan and South Korea, where it has developed a line of products to sell through local retailers. International business accounts for 15 percent of the company’s sales, but Morin expects it to be as much as 25 percent in the next two years. “We are now making it part of our strategy to go export and find places internationally instead of waiting for them to come to us,” he said.